Returning for its 68th race season, the lights were back on at Larry King Law’s Langley Speedway. Featuring six of its eleven race divisions, the .397 mile oval with its mere six degrees of banking stands to challenge every racer attributes making winning at Langley Speedway that much more special. Opening night featured Cycle City Corp Bandoleros and Legends along with the Bojangles U-Cars. Harris Truck Shop Super Trucks, Pepsi Grand Stocks and The Taylor Waste Services Late Models. With the lights shining bright before a stellar crowd, here’s a recap of all the exciting race action. Cycle City Corps Bandoleros 15 Laps: Ryley Music began his 2019 campaign picking up the series pole sporting his fast lap at 20.783 seconds. Logan Clark would get a share of the front row starting second. Green flag waved to start the season as pole sitter Ryley Music would lead lap one. After a few laps in, the race leader Music with Wyatt Philyaw and Logan Clark were able to break away from the rest of the grid. After a series of race cautions, Wyatt Philyaw would mirror the race leader Ryley Music’s every move but would run out of laps. 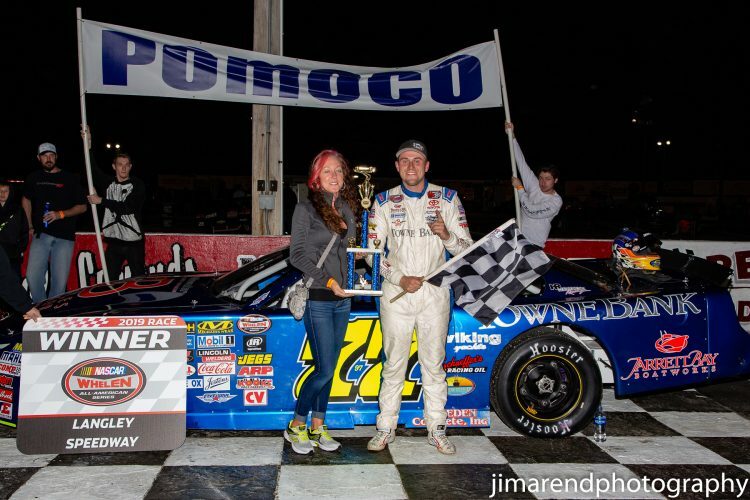 When the checkered flag flew, Ryley Music crossed the strip first for the race win. Music had this to say, “Oh yeah, just want to thank all my sponsors and my parents. I just want to thank them all for sticking with me all the way through”. Harris Truck Shop Super Trucks 25 Laps: Jacob Carr had the hot lap during Super Truck qualifying nailing down a 19.054 second lap. Earning the shotgun spot on the grid, Rick Poust was worthy of the position followed by Ronald Klein, Ryan Huff and Keith Wheeler as the five best. Green flag waved to the pole sitter who then lead the field into turn one. Rick Poust gave the leader a quick go from the outside but soon conceded the spot and settled in on second. With Jacob Carr showing the way, Ronald Klein was the early mover picking up a spot in second and setting sights on the leader. After a brief caution, Carr continued to lead Klein, Poust and Huff all single file. But then another race caution bunched back up the field and soon there was a battle for the race lead. Ronald Klein who started third in the feature took the race lead on lap twenty leaving Jacob Carr to regroup in second. Then, with two laps remaining, the caution flag waved setting up an exciting and thrilling finish. With the green back in the air, Ronald Klein nailed the restart, getting the separation he needed and went on to win the first Super Truck feature of the season. Ronald Klein in Victory Lane, “When I qualified third, I thought there was something missing. Found that we qualified with only three wires on and I thought if it was this fast on three, imagine how good it would be with four. It’s such a great feeling coming from the Enduros, us Enduro guys do know how to set up a Truck”. Pepsi Grand Stocks 40 Laps: Sammy Gaita nabbed up the Grand Stock series pole by boasting the fast lap set at 17.705 seconds. Jimmy Adkins earned a share of the front row followed by Tim Wilson, Paul Lubno and Dale Nichols as the top five. With the green flag waving, pole sitter Sammy Gaita wasted no time to establish the race lead. Tim Wilson along with Paul Lubno were part of the early mover club showing second and third. Laps later saw Tim Wilson take a turn at the race lead and with him came Lubno to second. As Wilson enjoyed his time as the new race leader, the lead was short lived when Paul Lubno sized him up and made the pass for the spot. Wilson quickly tucked back in behind the leader as Gaita was lurking in third waiting for an opportunity. But the opportunity never came as Paul Lubno once in the lead checked out and went on to win the Grand Stock feature. Paul Lubno in Victory Lane, “I did get into the #17 a little too hard so I rolled back and let him get straightened back up, then we went back to racing like we should do it. Gotta thank my crew, they give me a great handling race car, it’s a blast to drive”. Cycle City Corp Legends 25 Laps: Brian May took the Legends series pole with a lap set at 17.967 seconds. Ryan Matthews picked the two spot with Devon Courtney, Connor Jones and Colby Flowers as the five quickest in the afternoon time trails. With the green flag on full display, pole sitter May needed just one corner to secure the race lead. Ryan Matthews who was up to the task haunted the leader’s line as did Connor Jones. Laps later, the leader was able to get some separation from Matthews who may have been slowed from some lap traffic. But on this night in the caution free Legends event, Brian May was on his game going flag to flag for the race win. Brain May has these words in Victory Lane, “Amazing to be on pole, lead from wire to wire, it’s just awesome. Last race we won we went wire to wire so I just got to put it on pole and lead them all. Two weeks ago, this car was shoved on the side of the garage and in a million pieces. So, we talked, put the car together and see what we can do. It’s a rocket ship, one of the best cars I’ve ever had”. Bojangles UCar 25 Laps: Brandon Wood had the fast hot rod in UCar qualifying showing off his fast lap at 19.051 seconds. Courtney Shiflett earned her share of the front row in second, Mike Farley was third, Austin Davis fourth and Dean Ballew fifth. Green flag was once again waving to the grid and by turn two the pole sitter established his race lead. Mike Farley picked up a spot in second in the early goings as did Austin Davis to third. Soon after, the race lead for Brandon Wood started to expand as all Mike Farley could do was watch. Halfway in the feature was much the same as the leader continued his march. After a series of late race cautions, the field would get their shots at the race leader but Brandon Wood was having none of it and would go on to win the feature. Brandon Wood from Victory Lane, “Yes sir, gotta thank my wife a lot, she’s pushed me really hard and it’s a lot of her money that goes into it. I’m overcome with joy”. Taylor Waste Services Late Models 100 Laps: Brenden Queen claimed his first ever Langley Speedway Late Model pole with a lap set at 15.597 seconds. The lap knocked off CE Falk from the top spot but Falk’s lap landed him in a share of the front row. Greg Edwards, Justin Carroll and Connor Hall completed the five best in qualifying. Green flag waved to start the Late Model season and from the outside row one, CE Falk would lead lap one. On the move at the start of the feature were Greg Edwards and Connor picking up spots forcing the pole sitter fourth. Laps later saw CE Falk on a torrid pace mounting up a half a straightway length lead. On back, second, third and fourth were being contested nose to tail with Hall and Carroll picking up spots. After a quick caution to the race, CE Falk continued to lead with Hall in tow, Greg Edwards picked up some spots on the restart showing third. Just after the quarter century mark to the feature, the race was halted for the second time when Danny Edwards Jr went around. Back to the green, Falk would once again win the restart but this time, Hall and Greg Edwards would not let Falk get away. Nose to tail were the leaders who would soon leave the rest of the field to sort itself out. Laps before the halfway saw Greg Edwards take the two spot from Connor Hall but once the pass was made, Falk had distanced himself from both. Then the third caution flag waved for the spin of Rick Gdovic setting up another thrilling restart. Back to the green and the battle for the lead ensued. Connor Hall wanted it, Connor Hall then took it when contact sent Falk around to bring out the caution. With the green once again in the air, new leader Connor Hall bested Greg Edwards to secure the point. Justin Carroll along with Thomas Marks were making their way to the front in third and fourth as the halfway went up on the board. After a few more cautions to the race, Connor Hall would continue to lead but benefitting from the cautions and the cone restarts. CE Falk was back in second and eyeing the race leader but the leader was getting away. Soon after, Brenden Queen took second followed by Greg Edwards with CE Falk settling in the four spot. But while those spots exchanged hands, it was all Hall needed to motor on away and claim the checkers for the race win. Connor Hall in Victory Lane, “Yeah it was a really good opening night to kinda get our revenge on last year”, said the race winner. “I feel really bad about CE and I, I knew it was going to come down to the two of us and I really hate that we didn’t get to race it out. But I apologize to the #02 team but as for the #77 team, we’ve worked our tails off all winter. I’ve never liked winning on that way but I’m sure he’s made an accident in his career too”.